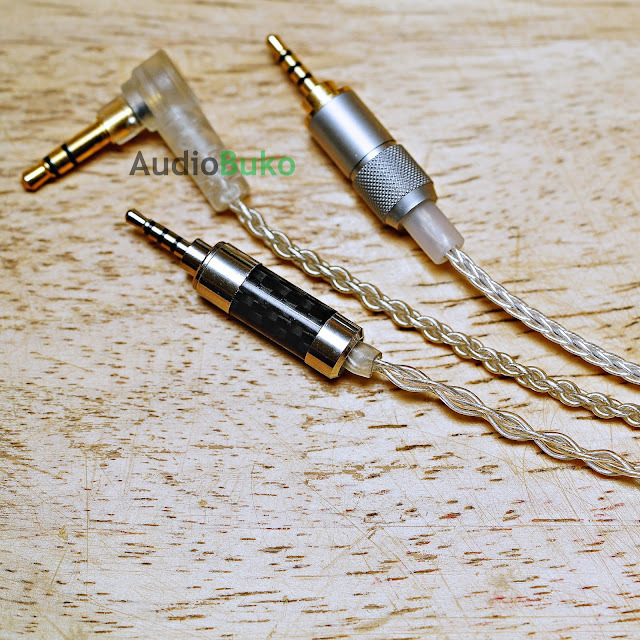 Whether you're a firm believer in cables making a difference in your audio chain or you just need to change your old/broken/missing cable, audiophiles will always look for good and affordable cables to use with their gear. 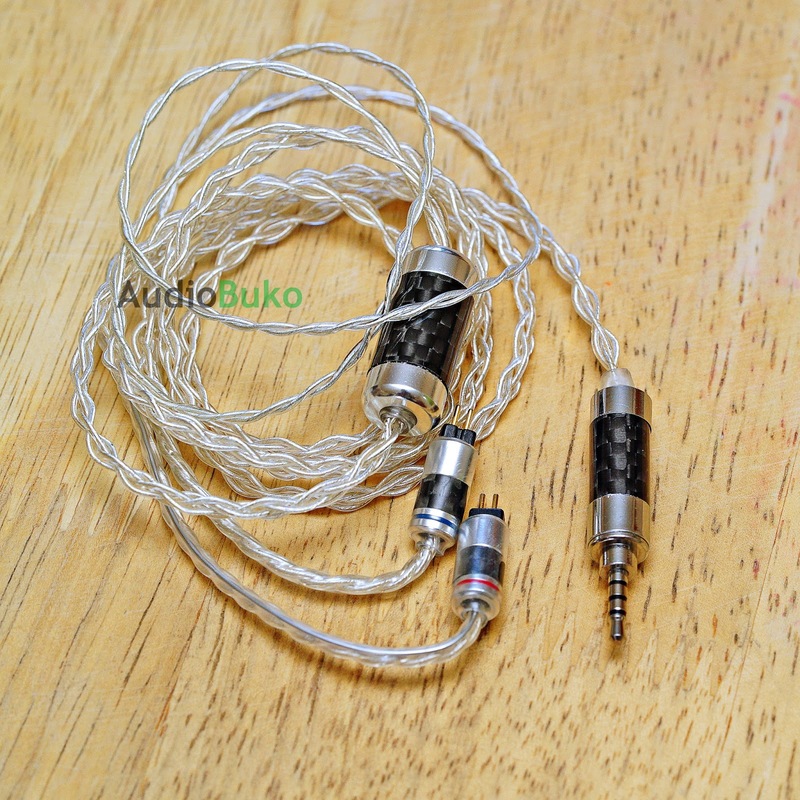 Enter Kabléon Audio, a relatively new (they're on Facebook as early as July 19, 2017) startup cable maker company from Cebu, Philippines, they make cables for IEMs as well as interconnect cables. The cable I bought from them (for the purpose of having a decent 2pin balanced cable, priced at ₱2,900 or around $55.55 USD (₱2500 or $47.89 USD for the cable, ₱200 or $3.83 USD for balanced plug and ₱200 or $3.83 USD for shipping locally) is the 4-Core Silver Plated Copper (SPC) cable with 2-pin connectors and a 2.5mm plug. Please note there are specific details I lack (and thus guessed on it) as I have not received any specific information from Kabléon Audio about the make and materials of the cable. They do ship abroad, so it's best to contact them directly for that possibility. 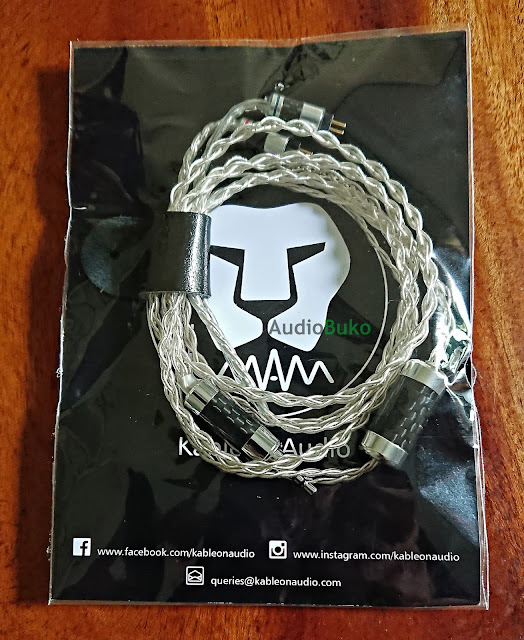 The cable arrived after a week of ordering inside a plastic resealable pouch backed by a stiff paper info board bearing the Kabléon Audio logo and some social media sites of the company. Inside is the cable held together by a nice leather clasp. The cable is made from SPC of unknown purity and width but is thicker than the Campfire Audio Litz Cable (Center) which is again thicker than the Fiio RC-78B (Top). The length of (effective) wire on the Kabléon is 43.5" (from plug end to connector end) with the plug body at 1" and plug at 0.45". In comparison, the Fiio RC-78B is 46" of effective cable while the Litz has 48" of effective cable. This is probably why I felt the Kabléon cable was a bit short as I was used to those extra inches with normal use of my DAPs, still putting them in my back pocket still leaves some space for the cable to move freely. Overall, the cable is nice to look at and feels sturdy, the wire is not slippery smooth but also not sticky or gummy to the touch, it's also soft enough not to memorize it's previous position and feels comfortable and light in usage. Now I used these on all my 2-pin IEM's (Seed and OS V3, yes, not a lot yet) and the most substantial changes can be heard on the V3, so I'll focus on that and the stock cable and Fiio cable. On Bass, the Kabléon exhibited less bass impact and sub-bass extension vs the stock cable but had more bass impact and extension than the Fiio. In this section, the bass difference can be readily felt and heard vs the Fiio and the Kabléon, still, what ever bass is there, the Kabléon was able to render fast and clear. On Mids, there was a small increase in overall tone that raised the vocals and instruments a tiny bit forward, there was a little bit more clarity vs the Fiio and even a little more than the stock cable. The note thickness was generally the same with all 3 cables but the stock V3 cable was thickest of the bunch. In this section, the Kabléon helped raise and clarify the mids for a more midcentric presentation of the music, good for acoustic songs. On Highs, the Kabléon extended the reach of the rendered notes by a small amount, not very noticeable unless you really focus on the high frequency notes. It beats both the stock and Fiio in this regard, and as I would like to believe I heard, helped make the notes more crisp and a little bit more airy. On soundstage expansion, the Kabléon helped expand it by a little bit on width but not much on depth, this applies to both the Fiio and stock cable. Putting them all together, the Kabléon 4-core SPC cable is a good upgrade cable for those in need of a little more expansion in their music and help lighten things up a bit with more clarity and presentation, pairs well with warm sources and warm/bassy IEMs. In my experience, most 2 pin cables try to dislodge themselves from my right ear, the stock V3 cable isn't one of them but it tries 😅 and in most case scenarios, memory wire is an annoyance to me, but on the Kabléon, the memory wire is actually alright (probably because of the shorter length inside, as well as the fact that it's not as rigid as some of the memory wires out there) the plastic sheath helps in the regard for an overall comfortable and capable cable to use everyday. Pros: Good looking overall construction, plug material looks and feels exceptional, is supple and seems to hold well to strain and pressure, helps increase the mid and treble areas of the plugged IEM, the wire clasp is of simple construction and looks but feels good and will likely last a long time. Relatively well priced for an upgrade cable. Cons: Reduction in sub-bass extension and impact may turn some off (but may be a pro if you intentionally want less bass on your IEM, which fits my case scenario), no chin lock, mere presence of the memory wire can turn people off, but since this is a custom cable, you can (ideally, since I haven't really asked) request for it not to placed in the final product. People can visit their Facebook page for more information as well as their pricing or general inquiries. Their cabling services as a company are pretty good with the amount of quality placed in the braid and general construction and materials of the cable, so it might be worth you time to support a local company and check them out. Also note that since these cables are hand made, it may take some time for them to be completed.